No Looking Back - "It's what you learn after you know it all that counts." I struggle with rubric writing. “The use of rubrics in the classroom began gaining popularity towards the late 1990’s” (Cwalina, 2010). I trained to be a teacher in the early 1970’s. What feels natural and normal to younger teachers who grew up in a rubric-driven education system has been a challenge for me all through the Instructional Medial program. Andrade (n.d.) defines a rubric as “a scoring tool that lists the criteria for a piece of work, or [says] ‘what counts’ ” and also “articulates gradations of quality for each criterion, from excellent to poor.” She goes on to explain that a rubric should “as concisely as possible … explain what makes a good piece of work good and a bad one bad.” What has become evident to me after reading many assignments and discussions in many courses over the past year is that the way Wilkes rubrics are written leaves students and instructors still having to judge for themselves what constitutes excellence. Terms such as: well/sufficiently developed, clear, adequate/inadequate, limited, superficial, subtle, voice, minimal, and evident awareness leave a lot of room for individual interpretation. It seems that even in courses at the Master’s level, except when it comes to counting APA style errors in bibliographies or the number of responses to a discussion, personal interpretation of general descriptive words still guides students’ work and instructors’ evaluations. Unlike students in a classroom, we online learners don’t even have the benefit of being able to compare work, grades, and comments to try to figure out what each instructor wants. So how, then, does one approach the problem of writing a rubric that will give students clarity? When I used to mark assignments and tests (yes — even math tests! ), I had to go page by page so that I’d do all examples of longer questions consistently. I was definitely a teacher who knew excellence when I saw it but who would have been hard pressed to put that into words. Rereading the Bresciani presentation this morning gave me a clue. She says (slide 5) that rubrics are a way of ‘norming’ teacher expectations and of “informing students what you are looking for.” These are easy words to write, but they can be very difficult objectives to meet. Some hard mental slogging may be required to work out what those general terms really do mean rather than just come up with other synonyms. Slide 15 was the most helpful. When I read those questions, I realized that writing rubrics has a lot in common with writing reasoned explanations. In an explanation, you make a claim and substantiate it with evidence. In a rubric, you set the set the target and then put into words what it will look like if a student is meeting this target. That’s what makes this kind of writing so difficult. You can’t just say what want; you have to say how you know it when you see it. Without the evidence, the explanation/rubric is just not complete. You have to reach deep inside and put feelings into words. You have to make internal standards which are usually a complex blend and delicate balance of many factors explicit. You have to balance brevity with explication. You have to box yourself in by ‘setting it in stone’. You have to put yourself in the shoes of struggling students — those for whom general descriptors hold little meaning or perhaps a meaning which is different from your understanding — and ask yourself what evidence they must produce to show you they ‘get it’. If a student, parent, or colleague could still ask “How will I know?” (which echoes the “how do you know” question that underlies inquiry-based learning), your rubric may have all the boxes filled in, but it won’t reveal to your students what it really takes to make you happy. It may not look like it because some of the work this week was late, but I’m actually racing to the end of this course so I can get ready for ISTE. My mind is running in all directions — reviewing collections of bookmarks so I can add new tools to my wiki, collecting my thoughts for a presentation about integrating Web 2.0 tools into math instruction, wondering what the audience will be like so I can engage them, and contemplating how to integrate the 5E’s into a session that’s essentially a ‘show and tell’. This is not a conference for math teachers; I suspect the attendees will be quite tools savvy. It’s not hands on; I won’t be able to set them exploring the wiki or a collection of blogs in order to discuss what fits their own classes. As well when I get in front of an audience the traditional teacher comes out and I’m more comfortable sticking to a script. What I will likely do is cut several new videos to a maximum of 2 minutes each — Dan Meyer, Sugata Mitra, Sal Wozniak (from week 2), and perhaps a bit of Maria Andersen and Derek Sivers. I want to start with I am a Canadian — but I’m not sure if American viewers might be offended by a few of his remarks, and I just have to work in Tom Lehrer who brings smiles to the faces of math teachers of a certain age. But those are the spice and the sizzle in the pan (engage)– what’s the substance (explain)? I know that I have to address the fears of teachers under tremendous pressure to get those standards met and give them evidence to persuade themselves, their admin, and their colleagues that there’s a better way to get students to learn math than just sticking to the basics and dressing up drill in songs. If it were a math conference, I’d provide some compelling research with which will help substantiate their desire (claims) to incorporate these tools even if at first they seem to be taking time away from what’s important. I’d want math teachers to walk away from the session giving themselves permission to try something that may feel very foreign (elaborate) and looking forward to going home to try some of the tools out (explore). With this audience I’m not so sure. Are they coming to be persuaded? Are they coming to take information home to the math teachers in their schools? Are they coming to be dazzled with something new? Are they coming? I think I can use the 5E’s as a guide to develop this session and I may start by trying to make a joke about how they could be rewritten to fit transmission teaching. I can assume that the audience is already curious because they’ve made time for my session when there’s so much competition for their time, but other than that I confess to feeling a little lost and I have this course to blame. 6 weeks ago I’d have just gone ahead and done my usual thing. Now that just doesn’t feel good enough! I have to start with the end in mind and I’m just not sure what that is at this point! In his book How Humans Learn to Think Mathematically, David Tall states that the key competence underpinning the learning of math is the ability to compress processes into “thinkable concepts” (p. iii) or “known facts” (p. 20) which can be manipulated “in their own right” (p.20). Compression is the brain’s way of getting around the limited capacity of its working memory which cannot hold more than five to seven pieces of information at one time (Kandel, 2008) and also makes possible the development of knowledge structures (Tall, p. 107) which can be further compressed or blended flexibly to solve highly complex real world and mathematical problems or to creatively invent new branches of mathematics (p. 121). Tall says that the “human brain has become a mathematical mind” by using three biologically built-in abilities: we recognise similarities, differences and patterns; we learn by repeating sequences of actions until they become automatic; and we use language to categorise, to name, to create symbols, to define, to formulate rules, and to reflect. In math, language also enables us to understand the dual nature of compressed objects which are at the same time processes we can do and concepts we can think about (p. 337). Tall observes that students’ reliance on such tactics as rote memorisation and counting strategies, although a successful strategy in the short run, will eventually limit their capacity to move farther “up the ladder of higher orders in math” (p. 192). For example, the student who uses repeated addition to perform long multiplication instead of compressing these calculations into known math facts can still manage to solve questions like 296×45. However, the mental demands of trying to use finger counting or strokes on a page to work out 683÷92 become overwhelming. Throughout his book, Tall uses examples like the one above to illustrate why so many students become stuck first in long division, then in fraction and integer calculations, and also in high school algebra and problem-solving. Some students simply resist letting go of “the limited imagery and complicated embodied procedures” (p. 189) which they developed early to help them learn arithmetic. Rooted in what Tall calls “common sense” learning, these understandings are familiar and comfortable, but they do not serve a person engaged in more complex math tasks very well because they’re so inefficient. As well they fuel the desire to find a less stressful way to accomplish the same task rather than a determination to do the compression work needed to overcome, rather than sidestep, the old barrier to new learning. A. Old understandings and practices tend to persist even if they have outlived their usefulness or fly in the face of the preponderance of evidence. B. To internalize new processes students must “compress” them –i.e. turn them into “thinkable concepts” Tall, p. 20) (math processes) or strategies (inquiry processes). According to McNeill, Lizotte, & Krajcik helping them do this requires deftly balancing such variables as individual and group readiness, the deliberate application and removal of scaffolds and “social supports” (p. 22) (i.e. teacher intervention), and the complexity of the material to be learned through inquiry. 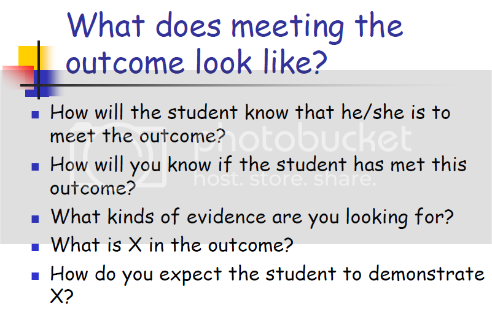 It’s also important that the teacher not make assumptions about students’ understandings of process or concept words. This is one of the things that I really like about Dan Meyer’s work. Because his techniques are evolving as he teaches classes of students who struggle in math, he has learned to back as far away as possible from all assumptions (even about such second nature aspects of math work as using letters instead of word or numerical labels) and allows the students opportunities to build up these understandings on their own. C. Mathematical thinking requires “the ability to repeat increasingly sophisticated actions until they can be performed automatically without a conscious thought” (Tall. p iv). But if there is only mindless repetition (application without learning), the kind that is fostered by what McNeill, Lizotte, & Krajcik called “continous scaffolding,” then the students will not as readily make the links and leaps required to get to the next level of independence. D. All three of these sources value the systematic development of knowledge. This definitely flies in the face of the current view shared by many constructivists that this value has been rendered old-fashioned and outmoded because of instant access to the internet and the rate at which information in such fields as science is growing and changing. Inquiry based learning may grow out of natural curiosity or from “baiting the hook” (from Meyer, as was mentioned in my last blog), but it isn’t haphazard. New understandings grow out of perceived limitations in previous learning. The 21st century change in our attitude towards knowledge should be that we must encourage students to consider whatever they know to be ‘the best so far’. Embracing the inquiry process can help them become open to adding to their knowledge or revising it or replacing it when old understandings don’t do the job any more. McNeill, Lizotte, & Krajcik (pp. 4-5): A lack of sufficient understanding of a topic may make it impossible for students to understand what counts as appropriate and sufficient evidence or distinguish evidence from theory or personal views. E. Metacognitive skills are an essential part of effective learning and investigation. Learning has a lot in common with long distance running. Both student and athlete need to know who knows where they are and where their destination lies. This ability to look back and look forward enables the individual to take responsibility for monitoring his own progress towards the goal. McNeill, Lizotte, & Krajcik (citing Wood, Bruner, & Ross, 1976; Stone, 1998, pp.18-19) In order for scaffolding to be successful, a child must have some prior understanding of what is to be accomplished. Tall, p.iii:”… the development of mathematical thinking depends on the increasing sophistication of perception and action as the child reflects on successive learning experiences. …the successive experiences that we encounter in life which fundamentally affect the ways in which we build current ideas on those we have met before. This is what makes the act of using one’s mind in a deliberate way to unearth mysteries, make connections, and turn loose collections of skills and facts into knowledge that becomes a tool through which to understand the next experience. This is want makes for mindful learning. Matt — I’m going to “Plan B” the rest of my work on this unit because I’m doing a presentation on using Web 2.0 tools in math and I want a spectacular example of inquiry based learning and how these tools can enable us to do things we have not found easy up to this point. I’m thinking about an application of Twitter in math class that I hope will overcome some of the old co-op model issues we’ve been discussing and will foster students’ ability to frame their problems, questions, and responses. The notions of (i) having only 140 characters and (ii) there being a larger audience able to see and respond are intriguing. I also think that the traditional KWL activity could be rewritten to help students frame better questions about what in math is giving them difficulty. The idea of investigable vs. non-investigable questioning seems also to apply to students’ being able to better articulate their difficulties with their work. If my grant application is successful and I and move forward the Australia plan, I’ll definitely be in touch for feedback as I develop my initial idea of basing that pro-d on inquiry based learning. Meanwhile, creating an example of a manageable way to infuse inquiry into math class in order to support what Dan Meyer calls “math reasoning and patient problem solving” has the potential to become a money-maker for me (now on a fixed income!). Western Canadian teachers are in the process of rolling out a new math curriculum, and there is a great thirst for ‘stuff’ that is well-conceived and gives high school teachers a handle on how to engage students by letting “math serve the conversation” (Meyer, 2010). Finally, my uploaded assignment cannot really be considered a paper in a formal sense. I decided to create a working document that would show you the process I went to through in order to create a collection of questions that I think change a typical ‘transmission’ taught lesson (Tall, p. 357) into an inquiry based learning activity. Let me start with the video that inspired me to change directions this week. I’ve tackled the problem of improving the effectiveness of teaching in math in a number of courses during the IM program, but I haven’t been entirely happy with what I’ve come up with to date. I keep returning to the Pythagoras theorem partly because it’s covered in two grade levels (8 and non-academic 10) in BC and partly because it’s one of those topics that’s easy to remember and use without having any real understanding of what it means, why it works, or how it can be useful. Most teachers show and tell the Pythagoras theorem rather than letting the students figure out the relationship themselves. Or … if they put scissors and graph paper into the kids’ hands, they’re still using the illustration to back up the theorem rather than as a way to invite the students into asking: “What matters here?” (Meyer, 2010). Commonly the result is that theorem is memorized and the example is forgotten. Then when difficulties arise in subsequent grades, the theorem rather than its underpinning of understanding is reactivated in an attempt to efficiently move students into more complex applications in trigonometry. This is when math becomes like a house of cards. If the bottom floor is poorly remembered, the superstructure becomes very fragile and can fall apart when something new and different is introduced on the top. This gets at the use of ‘proofs’ and pushing even students who will find these hard to follow to the edge of their understanding. Proofs have all but disappeared as a part of a the high school math curriculum, and yet figuring out why something works in math is when the the most powerful fusion of concepts and skills occurs. The Pythagoras proof is not complicated for high school students to follow (although I think the algebra goes by a little fast in this video), and adding it back into the course can develop students’ grasp of how the skills they are learning are tools with which to build more complex and meaningful mathematical thought ‘structures’. So this week, I’m keeping this conversation between ‘dydan’ (Dan Meyer) and ‘Independent George’ ( a blog respondent) in mind as I work my way into ‘mathland’ again. George: The Pythagorean theorem was my first encounter with proofs …, and I remember not being able to really grasp it at first, but nevertheless being aware that we were on the cusp of something huge. That’s the exact feeling I want to go for with my Australian teachers if I get there and as well as with my math audience at ISTE in June if I can. I’ll appreciate any and all feedback you can give me on this week’s assignment. This is the Wilkes Instructional Media Program blog of Sue Hellman. I am a recently retired teacher whose last job was teaching Math and Science in a small alternative high school for at-risk and high maintenance teens in Surrey, BC, Canada. I'm looking for new directions for my work and plan eventually to be working as a teacher educator at the university level. Thanks for stopping by.